When Ouspensky met George Gurdjieff and was introduced to the Fourth Way in 1915, he realized that the barrier towards knowledge lay in oneself; that one couldn’t find the truth without simultaneously laboring to become the truth. Superior knowledge could only come with sufficient preparation to receive superior knowledge. Ouspensky spent the rest of his life transforming knowledge into wisdom; laboring to make the Fourth Way principles his own and to share them with like-minded people. In so doing, he became an agent of truth for his age, carrying the wisdom of the pre-World War era into the middle of the twentieth century. For several years I was in journalistic work; I travelled – in Russia, in the East, in Europe. In 1905, during the months of strikes and disorders which ended in the armed insurrection in Moscow, I wrote a novel based on the idea of eternal recurrence. Ouspensky’s novel attracts appreciation but leaves its author as disatissfied as he was before writing it. He knows that, while his mind can theorize about higher dimensions, he himself remains barred from them. He therefore continued his studies and search. In 1907 I found theosophical literature, which was prohibited in Russia–Blavatsky, Olcott, Besant, Sinnett, etc. It produced a very strong impression on me although I at once saw its weak side. The weak side was that, such as it was, it had no continuation. But it opened doors for me into a new and bigger world. Ouspensky is notable for his sincerity and his ability to avoid self-deception. He does not allow himself to be carried away by anything less than the “truth,” which he is zealously seeking, and although other literature inspires him, he nevertheless perceives its shortcomings. It is also noteworthy that the public’s acclaim to his novel and lectures do not satisfy him. In these early stages of his life, Ouspensky can already draw followers and establish a teaching, but his conscience prevents him from leading others along paths about which he himself is insecure. The idea of ​​dimensions fascinates Ouspensky, which, apparently, is an enthusiasm inherited from his father. Time and the fourth dimension; that if man penetrates a higher dimension, he can perceive his time-body, witness his past, present and future, and live accordingly. It seems to Ouspensky an invaluable vision that would alter the whole course of one’s life. Ouspensky also ventures into theoretical studies of larger dimensions than the fourth and, in particular, of eternal recurrence – a dimension where the present life is experienced previously through an infinite amount of times. These are the bases of his novel, “Strange Life of Ivan Osokin”. “I studied occult literature, did all sorts of psychological experiments with Yogi and magical methods; I published several books, ‘Tertium Organum’ among them, and I gave public lectures on Tarot, Superman, Yogis, etc. Despite his intellectual adventures – and although Tertium Organum has achieved bestselling status – Ouspensky still feels barred from the reality of the dimensions he so strongly suspects. Although a bestselling author, he nonetheless remains unsatisfied with acclaim and continues his quest for truth, which would become the hallmark of his later years. Ouspensky later confessed that the strongest drive for self-knowledge and self-remembering was dissatisfaction with our present state; that nothing could lead more to advancement on the path of inner evolution than our revulsion with sleep. Ouspensky continues his search for a firm foothold of wisdom, expanding his research into more branches of literature and more exotic countries. He formulates the need of direct instruction and seeks to connect with schools of wisdom, which, he believes, might still exist in his day, as tail ends from ancient traditions now lost. In the early 1900′s, Ouspensky ventures to the Middle and Far East in search of traces of lost knowledge. He returns to Russia and gives lectures on his search for the miraculous. These presentations attract a significant following of like-minded people. In one of them, he is approached by two attendees and recommended to meet a foreign mystic who is visiting Russia during that time. In 1915, Ouspensky meets George Gurdjieff and immediately recognizes that Gurdjieff possesses the knowledge he had been searching for abroad. He becomes Gurdjieff’s pupil for ten years, learning from him the principles of the Fourth Way. The teaching occurs on the backdrop of the declining social order in Russia and is somehow complemented by it. The ‘Work’ as Gurdjieff calls is, can only occur under pressure, when nothing can be taken for granted and students are put to the most basic tests of valuing the spiritual over the physical. The current events force both Gurdjieff and Ouspensky to relocate. Meanwhile, Gurdjieff’s presentation also evolves and takes a different direction, which compels Ouspensky to leave him and continue working on his own. 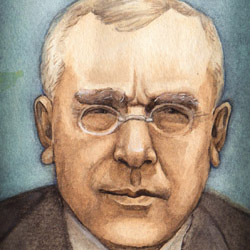 Ouspensky settles in London in 1930 and begins teaching the Fourth Way as well as writing literature about the system he had learned from Gurdjieff. Ouspensky dies in Lyne Place, England on October 2, 1947. Ouspensky recognized that, in meeting the Fourth Way, he was meeting something big. He sensed that it reached far back in time, perhaps as far as the earliest culture. He treated the Fourth Way respectfully and impersonally, as a system that did not belong to man – which was one of its chief strengths. By the same token, Ouspensky was hesitant to publish his works and attach his name to something much greater than himself. And, indeed, those books presenting his expression of the Fourth Way were published mostly posthumously. Furthermore, in the opening of Ouspensky’s book The Fourth Way, he acknowledges that the system does not belong to him. Ouspensky hoped that, if he could cause enough ‘disturbance’ – collect a sufficient number of really sincere and properly ‘prepared’ people – he might catch the attention of ‘someone’ who would come and give help. He wasn’t clear about the nature of this help and probably didn’t know himself what it may mean. Nevertheless, he sensed an immense responsibility in his role, and the remainder of his life was wholly and completely devoted to fulfilling that responsibility. But in the end, partly owing to World War II, he had to admit that all his work seemed to have failed to give the results which he had hoped for. Gurdijeff, too, dismantled his Institute, and the two agents of the Fourth Way reached the completion of their lives having fallen short of the external aims they had sought to accomplish. Ouspensky took full responsibility for students. He gathered them together and told them that they were completely free to carry out their search in any way and in any direction that seemed best to them. Outwardly, this was, in a way, a confession of complete failure, but inwardly, in the end, it gave him supreme victory, and, though he gave back their freedom to all those who had followed him, yet he never in quenched their hope, but indicated to those who might have real faith in him, that this very restoration of freedom was in itself the opening of a new door. The predominant emotion in me was fear – fear to lose myself, fear to disappear in something unknown… I remember a phrase in a letter I wrote at that time: ‘I am writing this letter to you, but who will write the next letter, signing it with my name, and what he will say I do not know.’ This was the fear.